Hailed as “British dance’s true iconoclast”, Michael Clark is a defining cultural figure. Since emerging in the 1980s as a prodigy at London’s Royal Ballet School, he has remained at the forefront of innovation in dance, collaborating with – among others – such compelling artists as Sarah Lucas, Leigh Bowery, Peter Doig and Charles Atlas, and musicians Mark E. Smith, Wire, Scritti Politti and Relaxed Muscle. Michael Clark founded his own company in 1984. It has since toured worldwide to perform at leading houses in Europe, North America, Asia and Australia, as well as on its home stage at the Barbican, where it has been a resident company since 2005. Michael Clark Company has also introduced dance to new audiences both by performing at unorthodox venues such as the Glastonbury Festival, the legendary Barrowland Ballroom in Glasgow, the Turbine Hall at Tate Modern in London and in the Whitney Biennial 2012 in New York where the company occupied an entire floor for four weeks, and through Clark’s collaborations with leading artists, fashion designers and musicians. "Awarded an honour by the Queen for ‘services to dance’ in 2014, Michael Clark staggered somewhat bemused out of Buckingham Palace into an extended period of introspection. This autumn, come see the fruits of the slow rebuilding of his company and the evolution of his own dance technique as he embarks on his second decade as a Barbican Artistic Associate." Featuring music by Erik Satie, Patti Smith and David Bowie. Michael Clark Company's new work continues Clark's history of close collaboration with contemporary artists, designers and musicians and includes music by Relaxed Muscle and Scritti Politti, lighting design from Charles Atlas, and costumes by Stevie Stewart. 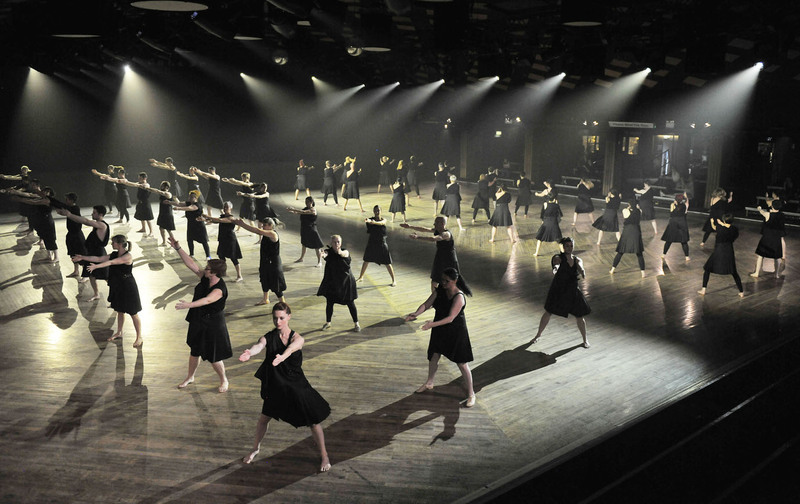 The production premiered at Tramway, Glasgow, and was performed at the Barbican, London; Ulster Bank Belfast Festival at Queen’s and Maison des Arts de Créteil, Paris in 2012. In 2013 the new, expanded production appeared at the Lowry, Salford, before another two-week run at the Barbican. Commissioned by Barbican, London. Co-produced by Barbican, London, Michael Clark Company, Maison des Arts de Créteil, Théâtres de la Ville de Luxembourg and Tramway, Glasgow. Michael Clark Company's critically acclaimed production come, been and gone is made primarily to the music of David Bowie and opens with a revival of Swamp, first created in 1986, set to music by Bruce Gilbert and Wire. Michael Clark chose to become a choreographer believing that actions speak louder than words. He creates work which combines his classical integrity with a more complex, contemporary sensibility embracing virtue and vice, abandon and control, grace and embarrassment. He is renowned for his legendary collaborations with bands, fashion designers and visual artists including Wire, Bodymap, Leigh Bowery, Trojan and Sarah Lucas. The costumes are by Stevie Stewart, with lighting by Charles Atlas. Commissioned by barbicanbite09 and Dance Umbrella (London), La Biennale di Venezia (Venice) and Dansens Hus (Stockholm) as part of European Network of Performing Arts (ENPARTS). Co-produced by barbicanbite09, Dance Umbrella, Michael Clark Company, Edinburgh International Festival, Théâtres de la Ville de Luxembourg and Maison des Arts de Créteil. With thanks to RZO Music Ltd and David Bowie. "Heroes" written by Eno (Bowie) and used by kind permission of Universal Music Publ. MGB Ltd.
As part of the 2012 celebrations in Scotland, Michael Clark Company created a landmark dance event for Glasgow over the final weekend of the London 2012 festival. Taking over the celebrated Glasgow Barrowlands, now a revered rock music venue and with a history as Glasgow's premier dance hall, this performance project was specially created by Michael Clark, and the project invited local people to become performers in the choreography alongside company dancers, accentuating the communal dance experience. The Barrowlands Project was supported by Creative Scotland and produced by Michael Clark Company, Glasgow Life and Dance House Glasgow.